We've gone and done it again. We're on CNN.com, this time in a little story about the first anniversary of their I-Report program. While Ace Jackalope is pictured, I'm not. In fact, it's the very picture above, taken at the Wigwam Motel in Holbrook, Arizona. Mind you, I sent them pictures of me, too. But as is usual, the Lope gets the face time. Isn't it enough that he usually gets the chicks? Bunny has a weetle eensey crush on Ace! 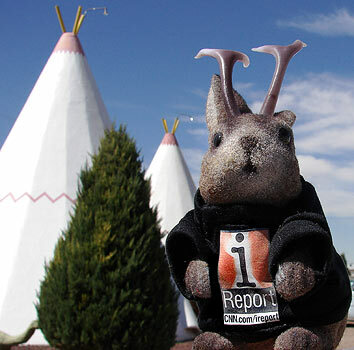 Bunny has NEVER seen such a handsome, well-travelled loper in the whole Land of Topiary! Bunny is going to read the whole blog to find out all she can about Ace! Cow has posted an attribution in the comments to the photo of Ace on Cow's site, and a link to Ace's blog. The Cow thanks Ace for allowing his photo to grace her pages and Cow offers her abject apologies for mistakenly thinking HE was her own Topiary Bunny (SHE). Gender is VERY tricky in the Land of Topiary, as in the Land of Jackalopes....got to watch or you can make a fatal faux pas! Had Bunny been searched by the Female Warden, would have been very embarassing!